It was everything you’d hope for from the home of an artist like Tomie dePaola: a bright, clean, beautiful, whimsical space, chock-full of colorful artwork and icons and tchotchke. A home populated with meaningful items yet somehow uncluttered, utterly restful to the eye. The group of bookish folks who had gathered there for brunch took in the artful home and the magnificent lawn and landscaping, and murmured to one another, “I think we’re living wrong.” We threatened to set up permanent camp—and that was even before we’d tasted the scrumptious brunch. 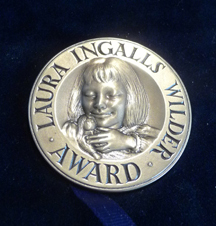 We were in New Hampshire to celebrate the latest feather in the talented Tomie’s multiply bedecked cap: the Laura Ingalls Wilder Award, which, in the words of the sponsoring American Library Association, “honors an author or illustrator whose books, published in the United States, have made, over a period of years, a substantial and lasting contribution to literature for children.” Only 18 children’s book authors and illustrators have won this prestigious lifetime achievement medal since its inception in 1954.